Located at the heart of the Northwest Passage, Gjoa Haven is a small community of Inuit people known for their kindness and hospitality. 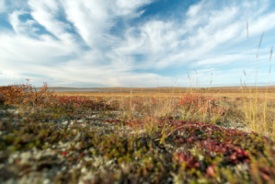 The community rests on the flat terrain of King William Island, and during the summer, wildflowers can be seen spread across the tundra. Travelers interested in arctic history will be able to explore the Heritage Centre, the Hamlet Centre, and the Northwest Passage Territorial Trail during their visit. As temperatures get warmer, other activities can be enjoyed such as hiking, fishing, bird watching, and ATV riding. In addition to these activities, visitors will also have the opportunity to see plenty of arctic wildlife, and can spend time at the Queen Maud Migratory Bird Sanctuary located on the mainland.